Our Philosophy | Central Coast Senior Services, Inc.
For over twenty years, we have been providing the support that allows elders to live in their own homes as they age, safely and with dignity. Central Coast Senior Services, Inc. offers peace of mind to adult children living away from their aging parents. The agency offers needed breaks to those children or spouses who are primary caregivers. We provide oversight and boots on the ground for attorneys, fiduciaries, and other professionals responsible for the wellbeing of clients we share. We work within the community to improve the quality of life for seniors and their families. Central Coast Senior Services, Inc. practices our business with a simple goal: We seek to care for our clients with the same high standards of professional and compassionate care we would want for our parents or ourselves. “Professional” Care goes beyond being merely being competent. We use best practices in every aspect of in-home care to meet the needs of our clients and their families. Our agency sets high standards of professionalism for our employees, and proactively maintains and enforces those standards in our daily operations. All our employees take part in a three-day initial training and ongoing professional development to ensure that they have the practical skills and knowledge necessary to provide our clients with the best possible care. Learn more about our hiring and training process. “Compassionate” Care is based upon the unifying human emotion of empathy, coupled with services that genuinely make a positive difference in our clients’ lives. Our agency strives to always remember we are caring for elders at a vulnerable phase of life. Compassion is a quality that cannot be taught, but one that we look for and cultivate in each employee. 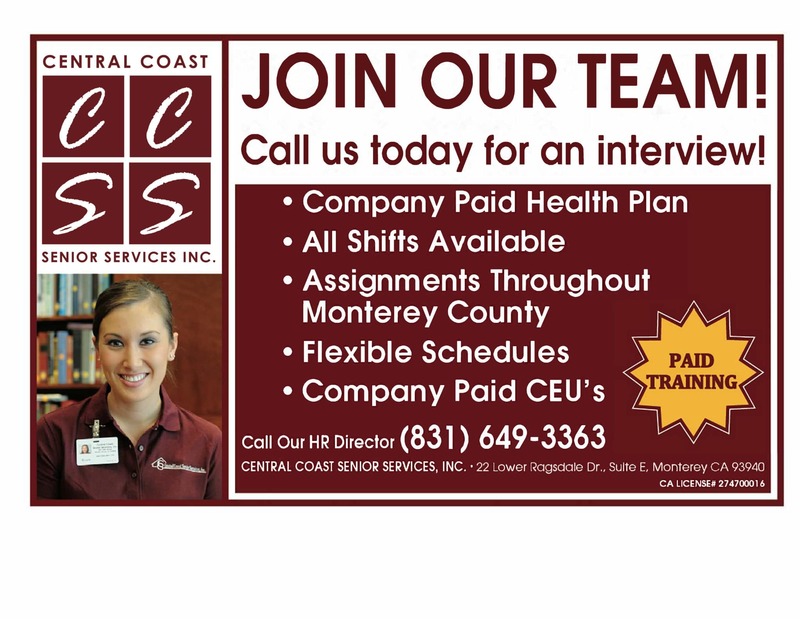 Central Coast Senior Services, Inc. is a non-medical home care agency that sets the highest standards of care in our industry.